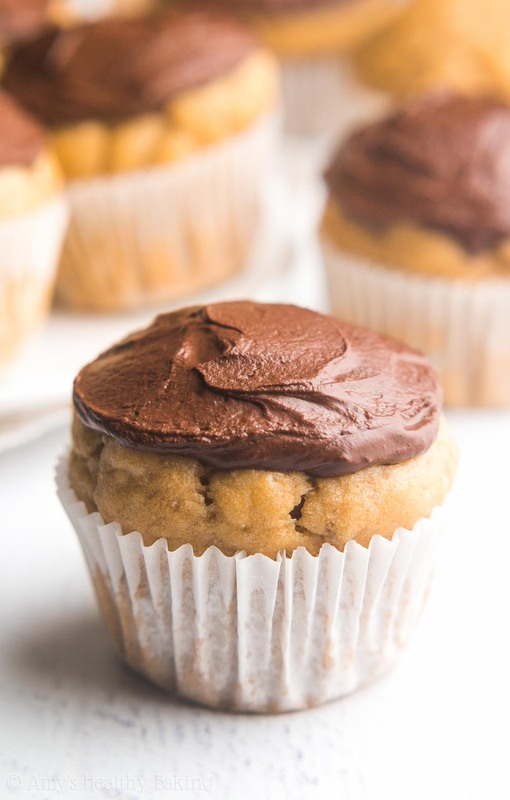 An easy recipe for mini banana cupcakes topped with rich dark chocolate frosting. 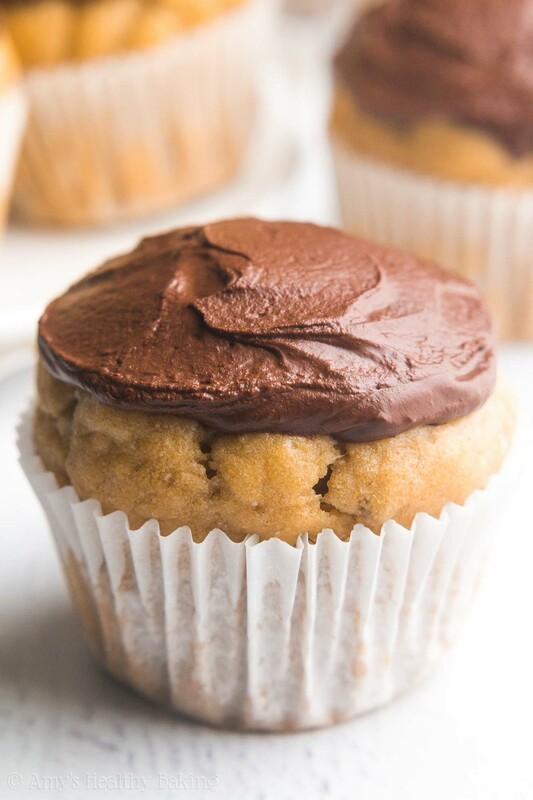 They’re sweet, tender & totally irresistible—and nobody will believe they’re healthier! Today’s recipe is brought to you in collaboration with Earth Balance. They make top-quality vegan, non-GMO, and 100% plant-based products (how cool is that?? ), including the buttery sticks that help give these adorable cupcakes their rich flavor and tender texture! In preparation, I poured myself a bowl of cereal for breakfast and dessert nearly every day for the next week to finish off my new half-gallon of nonfat milk, and I baked big batches of lemon bars and angel food cupcakes to use the unopened carton of eggs in my fridge. I also printed out various vegan-friendly shopping lists posted online by the healthy grocery store chains in town, carefully highlighting the items that sounded tempting and scribbling notes in the margins. The day before I officially began my vegan month, I bought lots of tempeh, tofu, and seitan for protein; vanilla soy milk and new granola (sweetened with brown rice syrup instead of honey!) for my morning meals; and soy-based shredded “mozzarella” along with my typical fruits and veggies. I refused to give up pizza or quesadillas! Because I loved to bake and refused to give that up too, I also purchased a vegan dessert cookbook from a bookstore downtown, and I found egg replacement powders and Earth Balance Buttery Sticks at the grocery store. Certain recipes, like chocolate chip cookies, just don’t taste the same when made vegan-friendly with oil… They need that irresistible buttery flavor! I successfully made it through the next month, and I really enjoyed that plant-based diet. I looked forward to eating lots of veggies, more than I typically did in the weeks before, and I also became much more conscientious of vegan-friendly baking. It was really difficult to find suitable baked goods at the grocery store—even something as simple as a loaf of bread! Mini Dark Chocolate Banana Cupcakes! 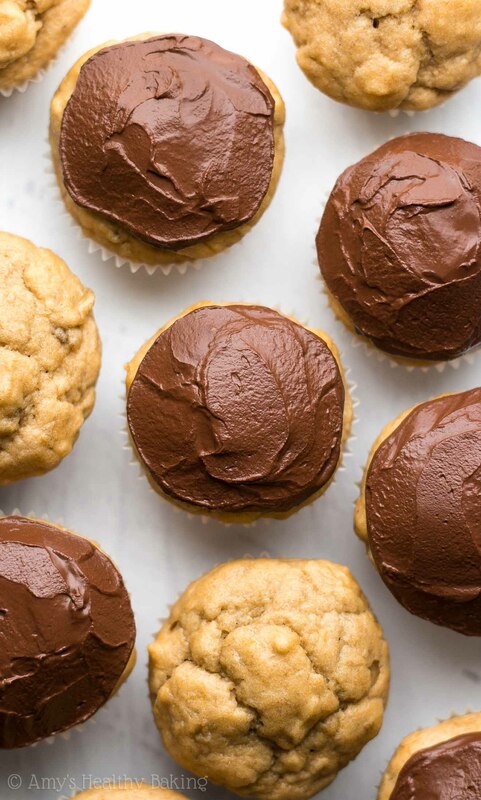 They’re moist and perfectly tender, just like traditional cupcakes, but they contain absolutely no eggs, dairy, refined flour or sugar. How awesome is that?? And that rich frosting… Just hand me a bowl of that with a spoon, and it’ll disappear in a heartbeat! 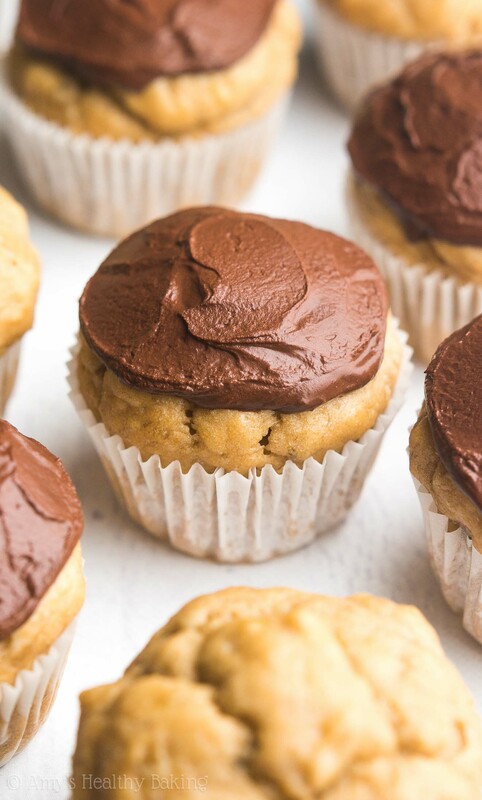 In these healthier cupcakes, the mashed banana plays four main roles. It gives them their fruity flavor, replaces the eggs, adds natural sweetness, and creates an extremely tender texture. You’ll need about 2 large bananas, and try to use the darkest, spottiest ones you can find! 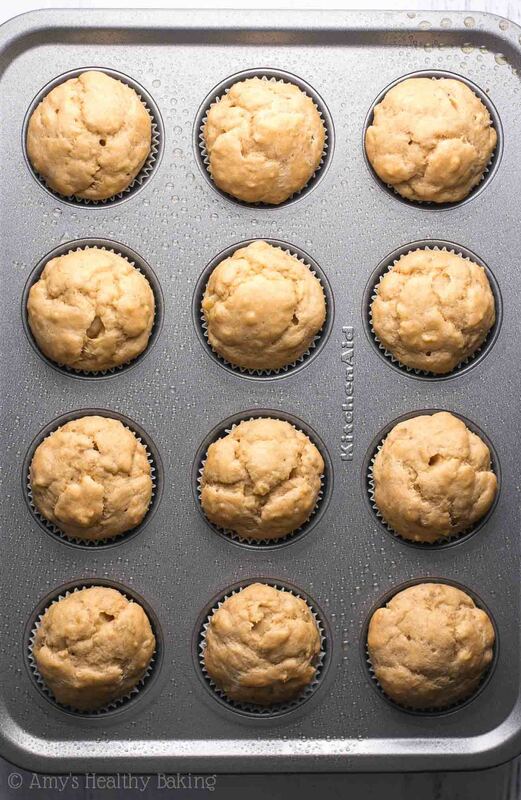 Those ripe bananas will be sweeter than plain yellow ones, which is ideal for sweetening cupcakes. The other part of the tender texture comes from Earth Balance Buttery Sticks. I fell in love with Earth Balance five years ago during my vegan month because it tastes like butter, melts like butter, and is great for baking. (Plus my brother really appreciates it when I use it in his baked goods!) 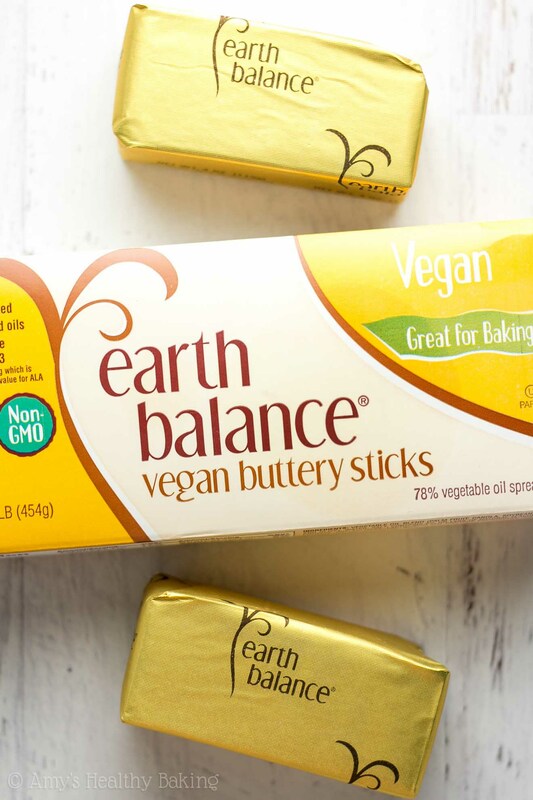 You can find the buttery sticks at just about any grocery store, as well as Earth Balance’s other vegan-friendly products. And finally, the frosting… Oh my goodness, this frosting. It’s one of the best chocolate frostings that I’ve ever eaten, and it’s so simple! You just need cocoa powder, milk, vanilla, and sweetener. Yes, that’s it! No messy powdered sugar and no mixers required—just a fork and a bowl. It’s important that you measure the cocoa powder correctly, using either the spoon and level method or a kitchen scale. I highly recommend the latter—this is the inexpensive one that I own! Too much cocoa powder will make the frosting taste bitter instead of decadent like 72% dark chocolate. And if you prefer your frosting sweeter, you can always add more sweetener to taste! Now who’s ready to bake—and eat!—some cupcakes?? 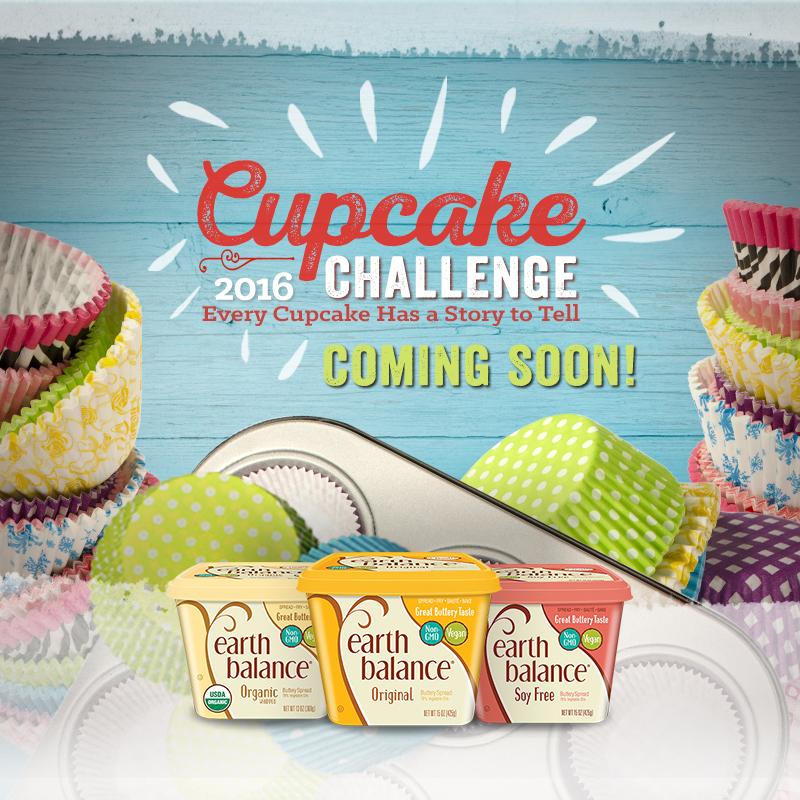 Even better, Earth Balance is currently hosting a Vegan Cupcake Challenge Contest that you can enter! One lucky person will win a weekend in beautiful Boulder, Colorado along with a $1500 Visa gift card and other awesome prizes. Check it out and enter here! 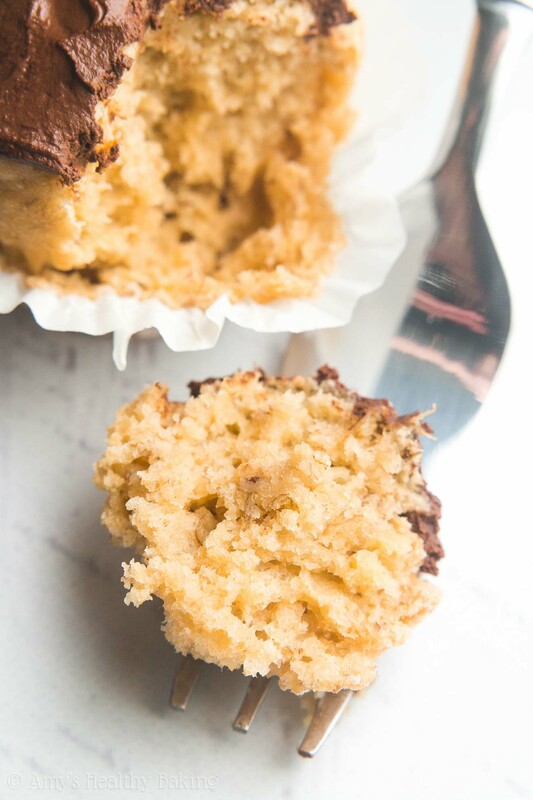 These little cupcakes are perfect for a light and easy dessert! 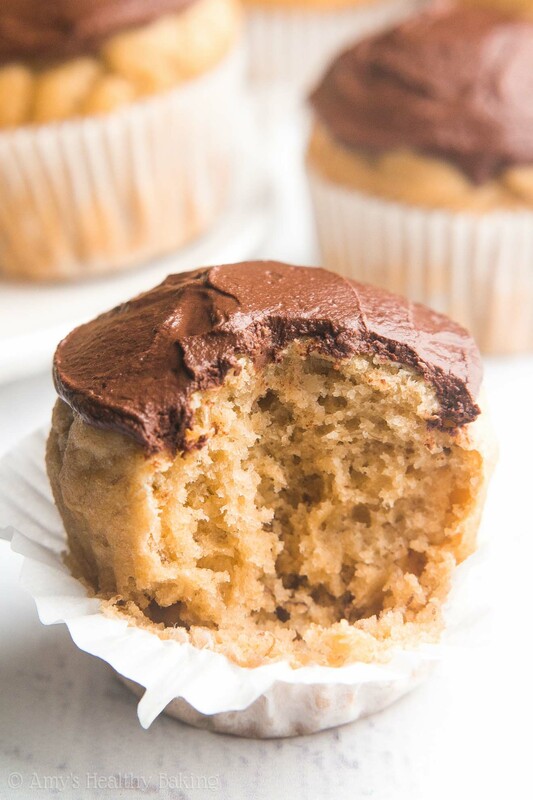 The sweet banana cake paired with the rich dark chocolate frosting is absolutely irresistible. Leftovers will keep for at least 5 days if stored in an airtight container in the refrigerator. 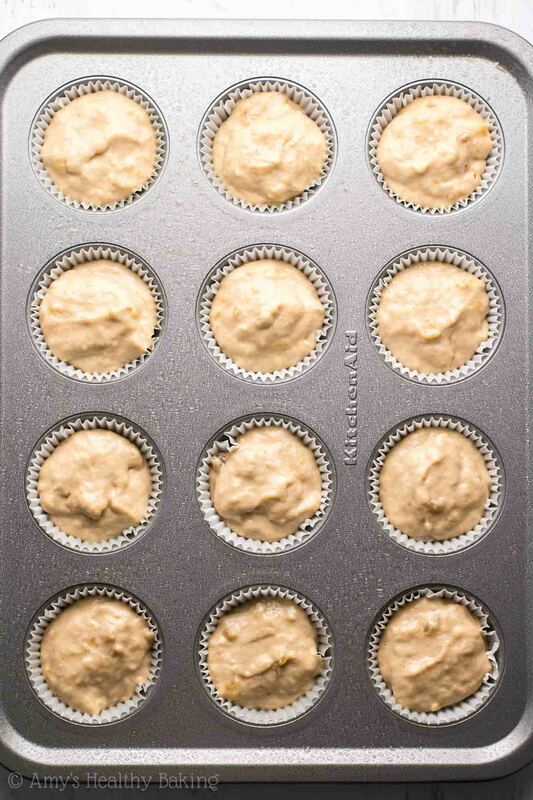 To prepare the cupcakes, preheat the oven to 350°F. Line 30 mini muffin cups with paper liners, and coat the liners with cooking spray. Divide the batter between the prepared paper liners. Bake at 350°F for 12-14 minutes or until the centers feel firm to the touch and a toothpick inserted into the center comes out clean. Cool in the pan for 5 minutes before transferring to a wire rack to cool completely. To prepare the frosting, add the cocoa powder to a small bowl, and make a well in the center. Pour in the milk, vanilla, and vanilla crème stevia. Stir until thoroughly combined. Spread on top of the cooled cupcakes. 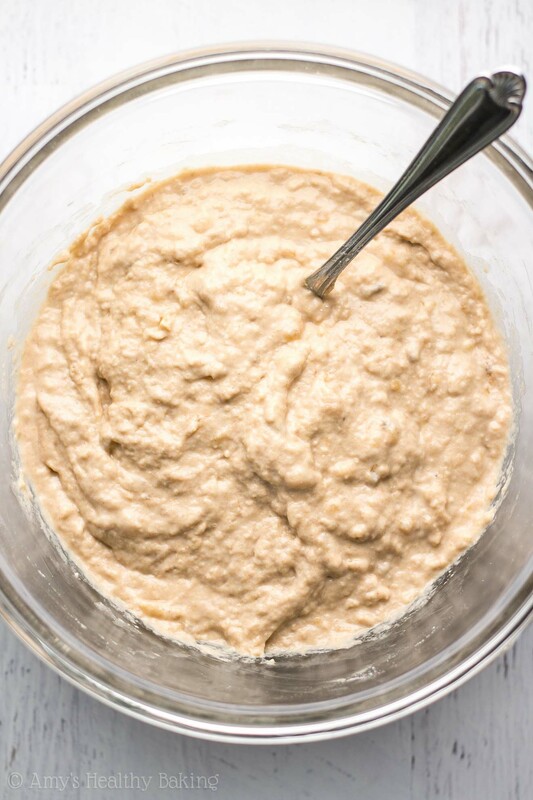 Notes: For the gluten-free flour, use the following blend: 1 cup (120g) millet flour, ½ cup (60g) tapioca flour, 1 cup (60g) brown rice flour, and 1 ½ teaspoons xanthan gum. Most store-bought gluten-free flour blends should work as well, if measured like this. If you prefer not to use stevia in the frosting, substitute 3 tablespoons of agave or pure maple syrup and decrease the milk to 5 tablespoons. It’s very important to measure the cocoa powder correctly, like this. Too much cocoa powder will make the frosting taste bitter instead of rich and dark, similar to 72% dark chocolate. 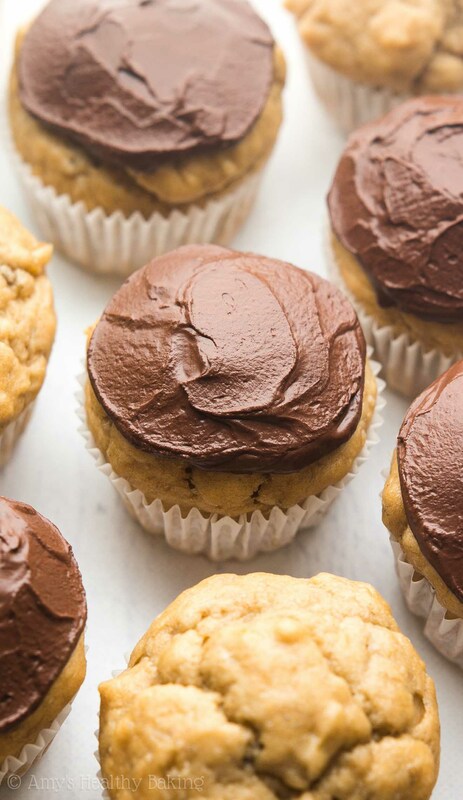 Any milk may be substitute for the unsweetened cashew milk in both the cupcakes and the frosting. For more substitutions, see the Nutrition Information page below. This post was sponsored by Earth Balance. As always, all text, opinions, recipe, and photographs are my own. Thank you so much Marina! The recipe should yield about 12 cupcakes, and I recommend following the directions in this recipe. (It’s almost exactly the same!) 🙂 I can’t wait to hear — and see! — what you think of the cupcakes! Keep those snaps coming!! Are you able to use almond milk, coconut oil not the butter or marg.. i don’t use sugar. I already answered that in the Notes section! 🙂 I’m excited to hear what you think of the cupcakes Ann! I’m truly touched that you’ve turned to my recipes as part of your recovery Louisa! It’s really hard to take those first steps down the path to recovery, let alone acknowledge and admit to a diagnosis like that in the first place, and I am incredibly proud of you for doing that. You are a very strong young woman to face your guilt and sadness head-on and start baking sweet treats, despite them tending to be a fear food for you. You are so brave and amazing!! It also takes a lot of courage to open up and tell your anorexia story in a public place like the internet, and I truly appreciate that you wanted to share that with me. ♥ I’m really looking forward to reading more comments from you in the future and hearing what recipes you try next! Heyy these look yummy ^_^ wanna ask that what can i use instead of buttery sticks? Can i change it with olive oil or something? Thanks Eda! I answer that in the Notes section underneath the Instructions (see the bit about the Nutrition Info page). 🙂 I’m excited to hear what you think of the cupcakes! Hi Amy, can I make this as a cake instead, and what dimensions of a square cake pan would you recommend? I would have to increase baking time, I reckon. Also, can I use all purpose flour instead? Thanks! Yes to all-purpose flour! I’d suggest a 9″-square baking pan. Start checking after about 22 minutes. I expect it’ll require closer to 30 minutes, if not more, but I don’t want you to accidentally overcook it if I’m wrong! 😉 It’ll be done when the center feels firm to the touch and a toothpick inserted into the center comes out clean. I can’t wait to hear how it turns out Kinny! Hi Amy, these were so easy to make! They were done in 26 mins, in a 9″ square pan. I used agave instead of stevia for both the cake and frosting. The cake was moist and light. Personally, I’d add a little more salt to it because I love the balance of salt and sweetness in desserts. The frosting was really dark, even with 5 tbsp agave! I’d try this with honey in the frosting instead next time. I had to add up to 8 tbsp milk to get this to a spreadable consistency. Had a lot of fun with this, thanks again! OMG Amy…these are incredible! Anything mini always tastes better for some reason! These were a hit with family and friends! I sound like a broken record but every recipe of yours is always spot on, whether it’s tender, crunchy, tasty and they are never overly sweet. YOU DA BEST!